In the 1600s, Europeans exploring the American southeast wrote of a purification ritual practiced by the native people, involving dancing, vomiting, and large amounts of what the travelers called black drink. Served from shell cups, the highly caffeinated tea was brewed from the shrub Ilex vomitoria, a species of holly. 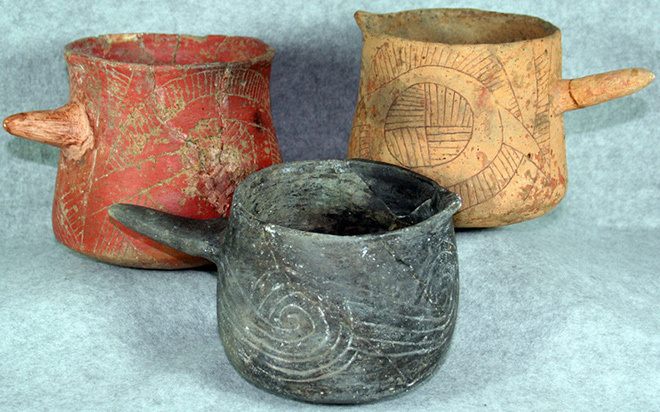 In a new study, researchers have found the first direct evidence of black drink — not in shells from Florida or Mississippi, but in ceramic beakers at the ancient city of Cahokia outside what’s now St. Louis, Missouri. The finding hints at a trade network that flourished centuries before Christopher Columbus landed in the New World, in which caffeinated drinks had Starbucks-like importance and possibly religious significance. Aside from the story, these cups themselves are absolutely beautiful. Hat tip to Steve for sending this article. This entry was posted in Cahokia, Ritual. Bookmark the permalink.